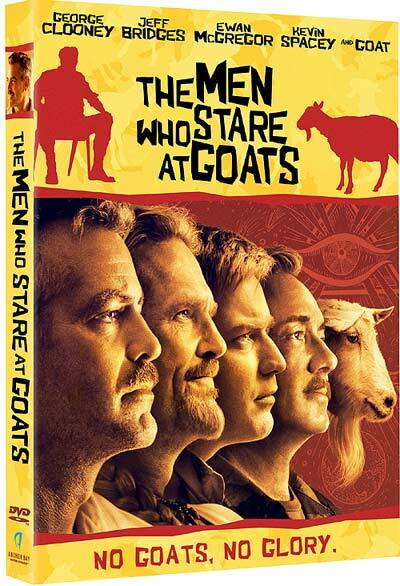 Editor’s Note: Fun and playful at times, serious and foreboding at others, “The Men Who Stare At Goats” is a hilariously good film. Check out my review of the film, written on November 14, 2009 for my Critical Writing class at CUNY Graduate School of Journalism. As he should, the Goat gets billing on the DVD cover. Overture Films’ independent release “The Men Who Stare at Goats” details the U.S. military’s creation of a Special Forces team of psychic warriors charged with defending the nation against its enemies – – without needing to fire a single bullet in the process. Simply put, they are Jedi Knights on Uncle Sam’s payroll. For first time director Grant Heslov, “Goats” signals a mission accomplished. With his comical adaptation of Jon Ronson’s 2004 non-fiction title, he takes this farcical, absurd notion and forces the audience to think outside the box – – namely to accept a reality where these super powered soldiers exist. And what a hilarious reality that is. “Goats” creates an alluring world loaded with adventurous and comedic three-dimensional characters – – the sheepish Michigan reporter Bob Wilton (Ewan McGregor) desperate to prove his worth and find purpose in life, the over-the-hill ex-psychic soldier Lyn Cassady (George Clooney) constantly wrestling with the ghosts of his past, and shaman-like Army commander Bill Django (Jeff Bridges) who would rather smoke hash and dance to classic rock music than lift a weapon against anyone. The plot of “Goats” is based on real life current events: Wilton, depressed after his wife files for divorce, travels to Kuwait as a foreign correspondent to report on the Iraq War for his newspaper. But upon arrival, he finds that he’s too late: America defeated Saddam Hussein and his armies, the Iraqis have embraced democracy and defense contractors chomp at the bit to spearhead the country’s rebuilding effort – – and make a boatload of cash. Wilton, disillusioned over his inability to get a journalist visa, chats up Cassady, a contractor set to enter Iraq on business. Yet, after “reading” Wilton, Cassady tells him the truth: he’s a re-activated member of the New Earth Army, a secret special forces unit that conditioned and trained psychic soldiers to do the unimaginable – – like bursting the heart of goats and remotely view people thousands of miles away with their minds. “So what you’re saying is that you were a psychic spy,” Wilton says to Cassady after learning about his past. “A Jedi Warrior,” Cassady replies bluntly. The joke’s multi-faceted meaning did not go unnoticed – – having McGregor, this generation’s Obi-Wan Kenobi, react to Clooney’s deadpan and preposterous reply was well worth the steep price of admission. The parallels between George Lucas’ space opera and “Goats” do not end there. Wilton and Cassady’s series of misfortunes during their journey across the deserts of Iraq harkens back to CP30’s and R2D2’s travels across the sands of Tatooine – – right down to the sniping back and forth banter. Engine failures, car crashes, land mines, windstorms, kidnappings and heated gunfights all befall the film’s two leads before the story reaches the third act climax. The film unfolds dually through the overt story of Cassady and Wilton’s trek and through diversionary flashbacks depicting the New Earth Army’s origins, as told through Wilton’s first person narration. This seesaw nature of plot development lends itself to the believability of a psychic soldier – – Heslov’s constant teetering between disbelief and affirmation of Cassidy’s “Jedi” skills, despite his asinine behavior throughout, leaves the audience questioning anything and everything on the screen. The mental exercise makes for an engaging movie going experience, never leaving the viewer bored for an iota of the film’s duration. Jeff Bridges as Bill Django. But it’s Bridges’ Django that stands as the film’s breakout character. One part Rambo, one part Gandhi, one part Freud and one part Yoda, Bridges races through each and every scene with an adorable vigor and vim reminiscent of his “Big Lebowski” character The Dude. The parallels between the two characters, however, end by the third act – – where Bridges plays Django with a much darker and defeated tone, one that adds a dichotic but believable depth to the former hippie commander. While the side-splitting nature of the story thoroughly entertains, Heslov’s implied message of the Bush Administration’s failure in Iraq purports itself as little more than a badly developed cliché. He succeeds in driving the point home through Django’s disillusionment over global warfare and the military’s penchant for violence above diplomacy. However, his depiction of modern-day Iraqi citizens as bullied weaklings in the face of their American liberators (in particular, when an irresponsible Blackwater-like squadron of mercenaries accidentally engage another convoy also filled with heavily armed soldiers for hire) leaves a bitter aftertaste as it detracts from the overall story. 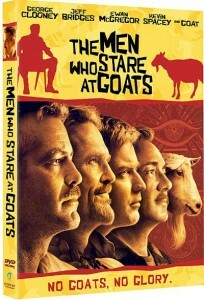 Despite these minor stumbling blocks, “The Men Who Stare At Goats” is a light-hearted dramedy that deserves at least a remote viewing or two, even if you don’t believe in that sort of thing.